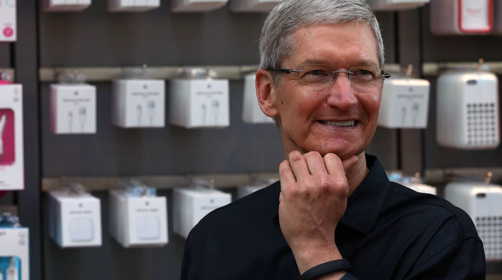 CEO of Apple Inc., Tim Cook. Apple’s journey along the yellow brick road has been marked by new technologies and new types of products raining features on consumers each time. It has changed the face of American Tech by offering products of the times beginning Apple II; MaCintosh through to iPods, iPhones, iPads now battling competition along the way. Apple’s competitive strategies and methods constitute a study in management for professionals and students alike. First, the event unveiling ‘iPhone 6’ will be held at the Flint Center for Performing Arts in Cupertino, California, where 30 years ago in 1984 the Macintosh was unveiled embellishing the emblematic event. Second, the event is likely to showcase two versions of ‘iPhone 6’ with larger screens ( 4.7″ and 5. 5″ ) with an update for its mobile OS the iOS 8; a new ‘iWallet’ mobile payment system with NFC tech; and a wearable tech device ‘iWatch’ with sophisticated sensors for measurement of sugar levels and sleep cycles. In addition, an announcement regarding ‘iTV’ is also on the cards. 1. Incremental Improvements : Large screens, iOS 8, 128 GB Storage, 20 nanometers A 8 Chip, Sapphire crystal screen in some models, getting photos on to the devices close to it when clicked – are some of the incremental series of variations to the model reinforcing the emerging category of customer opportunity in the market. It also seeks to establish its competitive advantage without breaching others’ turf. It also enables survival and coexistence – a requirement to secure the goodwill of both existing and new customers. Apple scores well here. 2. Fulfilling an identified need : Apple has established that it has made an audit of its own adaptabilities and tech superiority by fulfilling the consumers’ need for a product with a beneficial feature through its ‘iWallet’ expected to enable the role of a credit card. In a situation where 2 or more players dominate the market ( Apple, Samsung, Nokia … … ) action(s) of any one can be imitated/followed reducing the competitive edge. In the present times when the path to radical breakthroughs remain almost closed and competitive firms fight for a constricted source of revenue, the new feature can hold the company and stay the pace to maintain position. Apple achieves this here. 3. Prospecting in times of challenges : Any announcement regarding the ‘iWatch’ is likely to be the most significant event emphasizing Apple’s repertoire of “Prospecting” in new areas – a clear proactive strategy. This will mark Apple’s “Window of Opportunity” signalling its move to provide offerings served by a full line of products. Apple’s Health & Fitness apps support can get the ‘Diagnostic Business’ to accept the product readily. Many new apps are sure to follow. Apple sports a strong Brand Name; it has resources to exploit the market attractively; it has its own loyal base in a category where it is the leader; it has the resilience to overcome the market forces any way – all these factors spell a perfect combination for making the new product introduction a success. It also helps taking Apple through “niche marketing”. Apple’s product has always been perceived as a low – risk one. Apple enhances its strength here. More recently, Apple is also seeking to break new ground building on Unified Computing at individual level, linking home devices, shaping itself to be the David as opposed to the Goliath(s) engaging in Enterprise level attempts to establish industry standards. Will September 9, 2014 then be the day marked with a white stone for the company, customers and stakeholders is what crosses everybody’s mind now. Apple’s reign as ” Chakravarthy ” ( King of Kings ) of Tech Prowess will go through the test on that day. Tidbit : ” I never did anything worth doing by accident; nor did any of my innovations come by accident; they came by plain work.” – Thomas Edison.